It was founded in the US and currently operates also in Ghana, Nigeria and Taiwan. Recently me and ICT4D.at fellow Worlali Senyo went to Winneba, Ghana, to meet the people behind oneVillageFoundation Ghana and to look at their projects. Winneba is the main base of the oneVillageFoundation in Ghana, they have a building with offices and computer rooms there. Jacob Odame and Kafui Prebbie welcomed us and gave a short presentation of the projects which oneVillageFoundation is currently supporting, and the objectives of oneVillageFoundation Ghana in general. 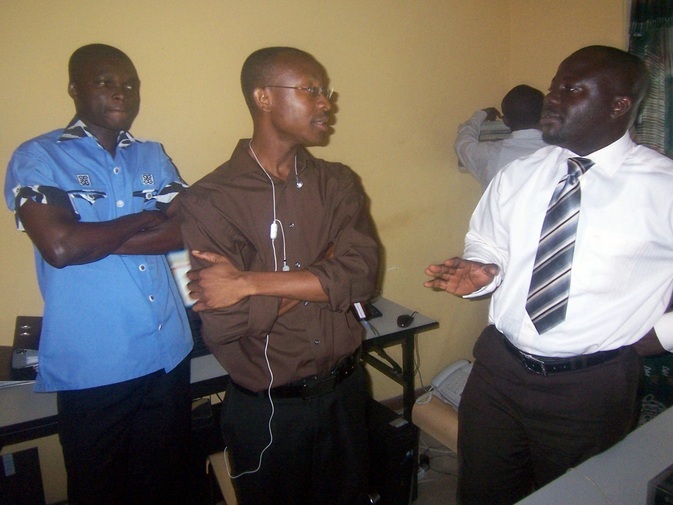 In Winneba the foundation provides computer classes, an internet cafe, acts as local partner for appropriate technology company Inveneo and has a NComputing sample solution set up. The latter two help a lot in their efforts to give consulting for other organizations who want to introduce ICT solutions. The computer room is built with the already mentioned NComputing device, a tiny and almost no energy consuming device which allows to split up the computing power of one PC to up to four workplaces – with monitor, mouse and keyboard each. This basically allows everyone to open up an internet cafe or easily equip a computer room with low equipment and energy costs. Due to the low power consumption it’s also possible to easily implement a backup power source as well as to minimize the cooling efforts – things which are of critical importance in a country like Ghana. Another way the organization serves the surrounding communities is by sharing their internet conection with them. 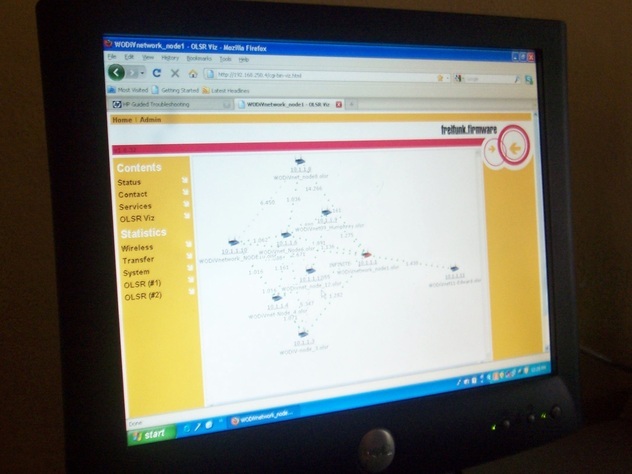 This is done with the German software Freifunk which allows to easily create large mesh networks by utilizing antennas and commonly available routers. This way only one participant of the network has to offer the conncetion to the intenet to make everybody profit. The same works in some cities in Austria with the initiative Funkfeuer. 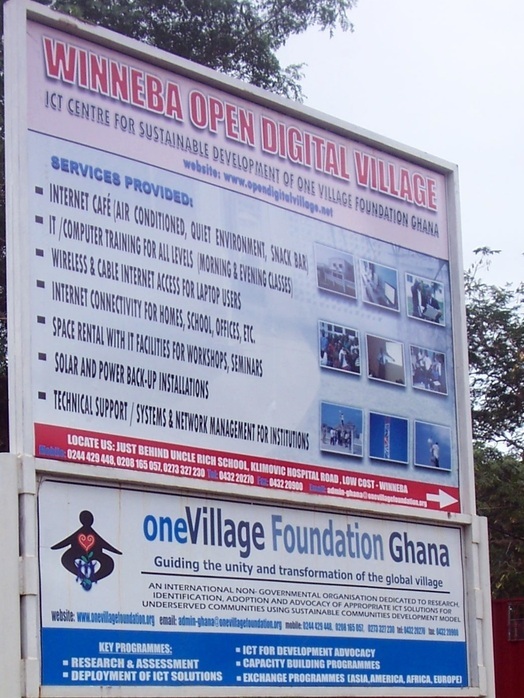 oneVillageFoundation Ghana is also part of several international projects, such as the Wireless Africa initiative aiming at promoting Community Owned Information Networks or the EU-initiated Digital World Forum focusing on the use of ICT to leverage economic development in Africa and Latin America. After a short walk through oneVillageFoundation’s facilities we had a discussion on how to get cheap internet to as many people as possible in Ghana – also mentioning several former UNDP efforts, the recent foundation of the Ghana Network Operators Group (ghNOG) which is a “forum for the exchange of technical information to ensure stability of the Internet Services in Ghana” and the Ghana Connect initiative. It was inspiring to see the innovative and highly appropriate installations oneVillageFoundation implemented. Also I am curious if their solutions will spread over Ghana in the future, increasing internet access by simple means. Thumbs up for Kafui, Jacob and their co-workers who do a good job serving a lot of people. If you want to know more about them and their projects check out the oneVillageFoundation homepage or the oneVillageFoundation blog. This weekend was really great for ICT4D.at! First we had the eDevelopment “Service delivery and eID” event on Thursday with interesting talks and eID specialist Carina Isabella Freudenthaler supporting us (Martin Konzett, Florian Sturm) live blogging and twittering. In the evening there was the first member meeting with Anders Bolin (media), Oliver Stern (economics) and Jasmin Giama (PR/marketing) who came from Berlin for the premiere of our movie Hello Africa. We talked about how a PR strategy for ICT4D.at could look like. On Friday also Jody (organization, finance) and Jason Knueppel (IT) joined us from Zell am See for the premiere of Hello Africa. It took place on Friday evening and was a big success – Schikaneder was full with approximately 85 people and we got great feedback. After some technical problems on the afternoon before we were happy that during the screening everything went well. The movie is now 49 minutes long, we need to do some more editing for the final DVD but soon it will be possible to order the movie from us. On Saturday we had another member meeting talking about the future of our organization and Oliver proposed a new project, acting as hub between donors and aid agencies in the field of ICT4D. 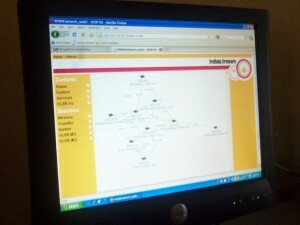 We’ll work out a nice description and put in on the ICT4D.at projects page soon. At the subsequent meeting on Sunday, Paul PÃ¶ltner (organization) joined us and we spent some hours aligning our organizational structure and talking about responsibilities. We’ve increased in members recently so going meta is vital for efficient work. We also agreed on a schedule for a planned book on how to manage an organization like ours – project BusinessForge. So, happy to meet everybody, looking forward to working with all you people!